Troubleshooting: Does the scrubber squeegee need to be adjusted? The purpose of the squeegee on a floor scrubber is to collect and guide the water to the scrubber’s vacuum to be collected after scrubbing. If your scrubber is leaving a trail of water behind, or if it is wearing out too quickly or creating too much suction (evidenced by a trumpeting sound), it may need to be adjusted. These instructions are specifically based on the Factory Cat Mag-HD. Other scrubbers may differ somewhat, but will still follow the same basic methods. 1. Remove the on-board wrench attached above the squeegee, if available. 2. 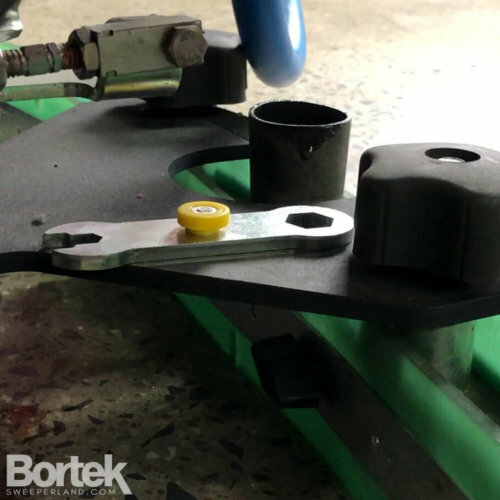 Use the included wrench to loosen the nut on the wheel caster and adjust the height of the casters to change the squeegee pressure. Over time, the squeegee wheel will wear down somewhat, requiring this adjustment. Make sure that the height is the same across the length of the squeegee, and that the wheels are reaching the floor. 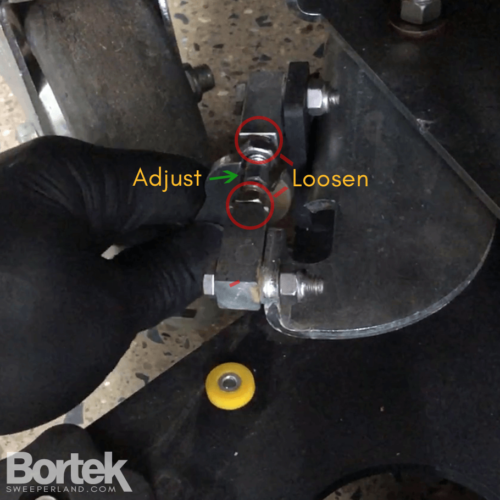 Tighten the caster nuts when your adjustments are complete. 3. 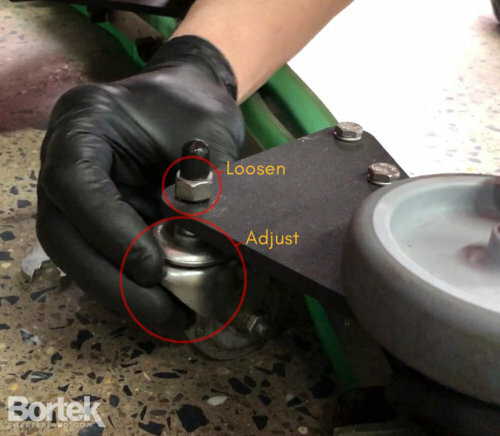 For minor tool-free pitch adjustments, you may be able to use the adjustment thumb-wheel in front of the center of the squeegee blade (not present on all machines). First, adjust the squeegee to be parallel to the floor. Then make small adjustments (about half a degree of pitch) forward to reduce air leak, or backward to increase air leak. Depending on your floor surface, the ideal angle of the squeegee blade may differ. Smooth floors will require a slightly greater air leak under the front blade than rough floors. For additional adjustments, loosen the nuts pictured here on the squeegee suspension. Then, rotate the bolt in either direction to raise or lower the squeegee height as necessary. Tighten the nuts when your adjustments are complete. • Make sure your squeegee blades are cleaned of dirt. • Check if the squeegee or vacuum system is clogged. • Check if squeegee blades are worn out. • Make sure adjustment areas are tightened. • Check if the squeegee suspension system is bent, missing parts, or otherwise damaged. • Remember that sharp turns and very rough floors may leave water behind, even when your scrubber is adjusted properly. If you still are unable to correct the issue, contact us for service!